If you need to borrow a bible, I’m your man. Hello friends, and welcome to BOOK! I’m Josh Way. And yes, we are going to talk about THE BIBLE. The Bible is perhaps the most famous book of all time, much more popular than Sniglets, and certainly the most quoted book ever by people who didn’t read it. And actually, of course, the Bible isn’t really a single book, it’s a library of several books that span thousands of years and several languages and traditions. The one I’m holding is a Hebrew Bible, but there are many versions, translations and editions. Some have pictures! Outraged moralizing from skeptics and non-believers who find the whole thing creepy and themselves insist that the Bible is full of regressive morality, myths, and inconsistencies. Sure, that’s painting with a rather broad brush, but I think that’s at least a reasonable caricature of the present situation. Contemporary discussion about the Bible tends to take place in the context of an overblown “culture war”, wherein the Bible is either the authoritative foundation for moral living or an impediment to learning and progress. The first group, religious types mostly, is usually cranky about something, e.g. the private behavior of others within the culture, and the Bible for them is a self-authorizing debate killer and a moral cudgel with which to smack sinners back into place. Then the second group, the skeptics and non-believers, reject the critique of the first group, and thereby reject what is – as far as they know – the Bible itself. Out-of-context Bible quotes are volleyed from both sides, everybody’s grouchy, comment threads are closed, and nobody learns anything. In the shuffle, the actual content of the Bible in its full context is completely ignored. This is where we come in! I find myself in the middle of this silly conflict. I was raised in the church and I am a faithful member and teacher in my church, and I’m a seminary student. But I’m also something of a geek and a comedy writer and a comics fan, so I have many friends on both sides: believers non-believers, Christians and atheists, everything in-between. I see people I’m very fond of on both sides of this fake war saying stupid things and missing the point entirely. That’s the premise of this show: What if our assumptions about the Bible are wrong? What if we’re wasting our time arguing about things that the people who wrote these old books couldn’t care less about? What if we took a breath, slowed down, and just read the books with fresh eyes and open minds? I am not an apologist. I’m not a proselytizer. I’m not interested in defending or justifying the Bible to a modern context. I’m much more interested in putting contemporary concerns aside, as much as that is possible, and simply trying to appreciate the historic circumstances which provoked the authors to write what we call “the Bible.” This is a show about history and literature. Is the Bible a religious book? Of course, but religion doesn’t (or shouldn’t) exist in a vacuum or for its own sake. Religion is the human response to extraordinary life experience, and before we can debate religion or morality, we should take the time to appreciate the historical reality that engendered it. That’s one of my contentions: that the people who wrote this stuff didn’t write it to give bland religious instruction to people thousands of years in their future. They wrote it as a response to an immediate experience, problem or danger, as a screed against political treachery, or a comfort to the oppressed. Whether you believe devoutly in the Bible or think it’s a load of hogwash, I really don’t want to change your mind. I just want us all to come away with the best information possible, so our discussions will be well grounded and more productive. You will also learn lots of cool names, like Oholibamah and Belteshazzar. And that’s it! Now, I know that if I do this right my religious friends will probably call me a sellout, and my skeptic friends will remain suspicious of me. Fair enough. I get it. But if you’ve ever wished for a smart, laid back, intellectually honest look at the content of the Bible without the preaching OR the deconstruction, this is for you. Above all, I really really want to have fun. Seriously. This book is wonderful and crazy, and deserves to be read the right way if it’s gonna be read at all. Today I’m just going to give you a quick example of how I approach the Bible, and then next time we’ll dive into Genesis and creation and all that stuff. Sound good? Let’s do it. First thing I want to accomplish today is to explain to you my method for reading the Bible. Right away this makes some people uncomfortable. 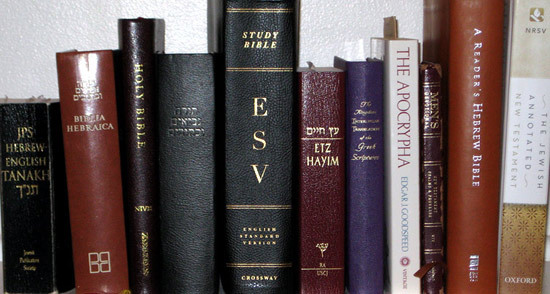 If the Bible is a universally foundational text, why does it need to be deciphered? Shouldn’t it be crystal clear what every word of it means at face value? This is an understandable assumption, but it is simply unrealistic. It’s also where most of this culture war tension comes from. The question is not whether or not the Bible should be interpreted, it’s HOW it will be. You can start with your own personal ideology – dogmatic fervor or naturalist suspicion – and work backwards, but you will inevitably bend the text to your will and learn nothing. Or, you can set your own assumptions aside and let the text speak for itself. Why and how would we do that? These texts were written on stone tablets and parchment scrolls thousands of years ago, in languages that have transformed or disappeared over the millennia. If we want to begin to understand them, we have an enormous cultural gap to traverse. Point number one: We have to learn how to read ANY ancient text, not just the ones that made it into the Bible. On one side there’s a red tinted looking glass. This is the lens of HISTORY. If we look through it, we can see the reality of a distant time and place. We can see the circumstances swirling around people who lived then, and how they might feel in that moment. On the other side is a blue tinted looking glass. This lens is LITERATURE. Looking through it we can see the strange genres, formats, and idioms of people who wrote in far, ancient places. Only a tiny fraction of the population of the ancient Near east could read or write, and writing was an act of urgency and persuasion, not leisure. Many of the styles and genres of this world are completely foreign to us, and we have to consider that or we will make mincemeat of the text. Now, imagine a big old pair of 3D glasses forged out of these two lenses. Together, HISTORY and LITERATURE give us a multi-dimensional view of the text and a sense of when, why, and how it was written. The point is to get us closer to the author’s ideology than our own. Otherwise, whether we’re a religious reader or not, we’re just making the text dance to our whims. Sounds fine, but how does it work? Well, let’s try it out. For this example, I’ve intentionally selected a relatively obscure and problematic passage from the Bible. This will help us try our method on for size without distracting us with hot button issues or a well-known Bible story. 15 Then the people of Israel cried out to the Lord, and the Lord raised up for them a deliverer, Ehud, the son of Gera, the Benjaminite, a left-handed man. The people of Israel sent tribute by him to Eglon the king of Moab. 16 And Ehud made for himself a sword with two edges, a cubit in length, and he bound it on his right thigh under his clothes. 17 And he presented the tribute to Eglon king of Moab. Now Eglon was a very fat man. 18 And when Ehud had finished presenting the tribute, he sent away the people who carried the tribute. 19 But he himself turned back at the idols near Gilgal and said, “I have a secret message for you, O king.” And he commanded, “Silence.” And all his attendants went out from his presence.20 And Ehud came to him as he was sitting alone in his cool roof chamber. And Ehud said, “I have a message from God for you.” And he arose from his seat. 21 And Ehud reached with his left hand, took the sword from his right thigh, and thrust it into his belly. 22 And the hilt also went in after the blade, and the fat closed over the blade, for he did not pull the sword out of his belly; and the dung came out. 23 Then Ehud went out into the porch and closed the doors of the roof chamber behind him and locked them. There. Just let that Bible story wash over you. Meanwhile critics of the Bible see a dark and ugly story about a deceitful assassin who murders a defenseless invalid in the name of God. Is this the kind of hero the Bible is offering us? Neither approach can do the text justice. But suppose we were to employ our twin tools of HISTORY and LITERATURE to help us understand what’s really going on… Time to put on your Bible glasses, kids! In English we call this the book of “Judges” but the Hebrew word “shofetim” could be more appropriately translated “chieftans” or even “warlords.” It’s about a very chaotic and violent time in the early life of the ancient nation called Israel. One of the unique features of this country was that it didn’t have a KING, at least not at this very early stage in its development. Just about every nation, state and people group in the ancient world had a supreme ruler of some kind, but instead of a king, Israel was ruled by a family of priests who insisted that Israel’s god was supposed to be their king, and that appointing a human ruler was to doubt his authority. This opinion was strong among the old guard conservatives in Israel. But – also within Israel was a large group of young radicals led by the tribe of Judah – the biggest of twelve family groups which made up the nation. These men and women believed that Israel needed a king and an army to protect it against the city-states which surrounded it. These radicals wrote the book of “shofetim” as an argument that Israel needed a king ASAP. The book is brash and provocative, and clearly intended to make the old guard traditionalists uncomfortable. After a brief introduction detailing Judah’s many victories against Israel’s enemies, the bulk of the book is a collection of crazy stories which highlight the turmoil and chaos of the nation’s life without a king. In every story, an enemy threatens Israel and an unlikely (unsavory) hero rises up to defeat it. In this story the enemy is the king of Moab – one of Israel’s worst enemies since before they were a nation – and the hero is a left-handed guy named Ehud. Left-handedness was considered a disadvantage in the ancient near-east, and each of the so-called “judges” in the book is at some disadvantage. In another story it’s a woman named Yael who kills the bad guy with a spike through the head. And then there’s the sad and sordid tale of Samson, a big dumb guy who defeats Israel’s enemies but destroys himself in the process. Each story is more bloody and explicit than the last, and the not-so-subtle message is clear in a line repeated four times throughout the book: “In those days there was no king in Israel, everyone did what was right in his own eyes.” If Israel had a king, says Judah, none of this ugly stuff would have happened to us. And that’s the book of Judges in a nutshell. A polemic from an ancient “culture war,” A war, by the way, which the young radicals eventually won – as detailed in the next few books. How successful the whole king initiative was for Israel is a topic for another time. Now, if you’re thinking “this sounds more like politics than religion!”, then you’re getting the idea. Remember: in the ancient world there was no division between what we call “religion” and “politics” as there is today. Issues of everyday life – how will we eat? how will we live? who will rule over us? …were every bit as religious as they were political. This is a huge key to unlocking the meaning behind biblical texts. Again, this is just a taste of how we’re going to be looking together at the Bible. And it will get much more interesting, I promise. We’ll inevitably hit on some hot button issues, but remember: we’re first and foremost interested in how the text would have fallen on ancient ears than on our own. Next week we’ll look at Genesis chapter one, and wherever you land on that one I’m fairly confident I will surprise you. This has been BOOK. If you enjoyed this remotely, I urge you to share, blog, like, and tweet this webcast to your online friends and family. If you have any questions or constructive feedback, email me at book@joshway.com. Read the BOOK blog and find more content at BOOK.JOSHWAY.COM. You can also leave a voicemail at 801-760-3013, and maybe I’ll answer it on the podcast. That’s it for me, pals. I’ll see you next time.